Ladies and gentlemen, the day has come: it's time for a new list of unreliable CarMax cars. You know what this means: I'm excited. You're excited. And CarMax is probably going to raise the warranty prices on each of these by 50 percent the moment they see this list. For those of you who don't know what the hell I'm talking about, allow me to explain: about two years ago, I purchased a used 2006 Range Rover – a vehicle with roughly the same durability as disposable contact lenses – from nationwide used car retailer CarMax. While I was buying it, I discovered that CarMax offers a long, bumper-to-bumper warranty on any car in its inventory. So I responded in the way any normal person would: I stood up and did a celebratory jig right there in the showroom. 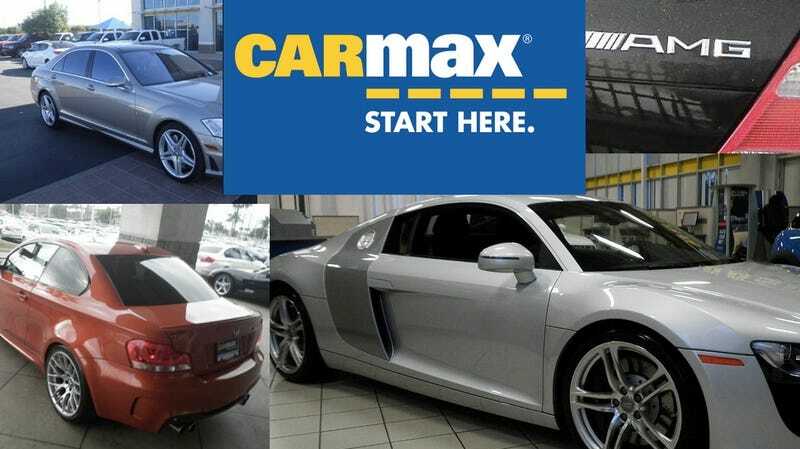 The result has been exactly as you'd expect: although I'm only two years and two months into my warranty, CarMax has already paid out $6,149.03 in claims – or roughly 57 percent more than the warranty cost to buy. And now you, too, can join in the fun with your own CarMax warranty, which I highly recommend on the following exciting and unusual unreliable used cars. Yes, ladies and gentlemen, CarMax has an R8. This is no secret. I say this because this car seems to be in very high demand, having been transferred three times to three separate stores: first Los Angeles, then to Las Vegas, and now to Colorado. In fact, it seems to be inching closer to me, which only makes it more tempting. I called on warranty prices for this thing, and I discovered that a bumper-to-bumper plan for five years or up to 125,000 total vehicle miles costs just $4,499. But since you probably won't reach 125,000 miles in five years, consider the 75,000-mile plan: it's just $2,989. The deal of the century. Somehow, CarMax always seems to have a healthy supply of BMW 1 Series Ms. And while there are always a few commenters who question my characterization of these things as "unreliable," I think we'd all agree that the best way to own a used high-performance BMW of questionable ownership history is with a long, comprehensive warranty issued by an automobile dealership who primarily makes money by selling service plans on Altimas. In my long, sad years of staying up late and searching CarMax inventory, I don't think I can recall seeing a vehicle that so desperately needed a warranty like the Jaguar S-Type R. I'm stunned they even offer this car, which is known primarily for two things: 400 horsepower, and constant breakdowns. I know there are better deals out there than this S-Type R. But ladies and gentlemen, I promise you this: when all is said and done, this will end up being the cheapest one you can buy. The CLK55 AMG Coupe is one of my all-time favorite cars. Styling is gorgeous and simple, sizing is perfect, and it uses a naturally-aspirated 362-horsepower 5.4-liter V8 that provides excellent, smooth power at any RPM. The only problem: this is an 11-year-old German car made by the two paragons of unreliability: Mercedes-Benz and AMG. So I highly recommend a warranty, which almost nobody is willing to sell on a car this old – except crazy CarMax, who is offering this gorgeous example for just $17,000. When I did a list of unreliable CarMax cars four months ago, I proudly featured this S65, calling it the Holy Grail of CarMax. Back then, it was a thousand dollars more expensive, and it was still a great deal – especially since the warranty was only $3,589 for another 59,000 miles, or $5,599 for another 84,000 miles. Although I suspect the bizarre tan color is holding this one back from finding a buyer, it shouldn't be. C'mon, people: you don't want black or silver anywhere near as much as you want a warranty. As every Porsche enthusiast knows, the "996" 911 model – made from 1999 to 2004 – has a severe engine issue with the intermediate shaft, or IMS, that results in catastrophic engine failure without warning. Although such a failure can be expensive, buying this 996 with a CarMax warranty means you don't have to take the risk: just pony up a few grand for MaxCare and drive along without a care in the world. Need a new engine? That'll be a $50 deductible, please.